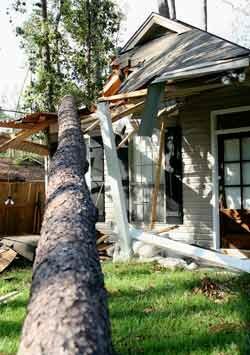 Home › Homeowners Insurance › If a tree falls…and it does damage…what is my responsibility? Tree coverage is so confusing. If a tree falls, is it covered under my homeowner’s policy? Here are some helpful guidelines but please call us with questions about your unique situation. Note: Windstorm or freezing is not on the list. Most policies will pay up to $500 to remove a fallen tree from a structure. Under certain circumstances there may be coverage when the tree does not damage a covered structure but blocks a driveway which prevents a motor vehicle from entering the residence premises or blocks a ramp designed to assist a handicapped person. The cost to remove the tree from the house is limited to getting that part of the tree off the structure ONLY. The cost to cut up the tree and remove it is $500 per tree not to exceed $1,000 regardless of the number of fallen trees. A common question is: What if my neighbor’s tree falls on my property? For your neighbor’s policy to pay, you must prove they were negligent in the care of the tree (was it dead, they knew it and did nothing). If not, you should make a claim under your own policy.